Omaha Poker online is a variety of poker that is swiftly growing in popularity. Omaha Poker is similar to Texas Hold’em in that each player is dealt pocket cards face down and must form the best possible poker hand using them and the community cards, which are dealt face up on the table. Omaha Poker is also popular in its Hi/Lo version. In Omaha Poker, each player is dealt 4 pocket cards (as compared to 2 in Texas Hold’em). In Omaha Poker, players must form their 5-card poker hand using exactly 2 of their pocket cards and 3 community cards. Pot Limit Omaha is a popular version of this game which limits players as to the number of bets they can make and to betting a maximum of the number of chips already in the pot. Each hand starts with two blinds (preliminary bets made by two players before cards are dealt to encourage action), in the same fashion as Texas Hold'em. Hole Cards: Four hole cards (also known as pocket cards) are dealt, face-down. 1st Betting Round: Players place the small blind and the big blind. Betting action proceeds around the table, starting with the player immediately clockwise from the big blind. The Flop: As soon as betting for the first round is complete, (once everyone has had an opportunity either to fold or match the total betting) the dealer deals three cards face up in the center of the table. 2nd Betting Round: Follow rules in round 1 above. The Turn: The fourth community card, known as "the turn", is placed face up on the table. 3rd Betting Round: Follow the rules in rounds 1 and 2 above, however, table stakes are now raised to the higher stake amount, e.g., $10 in a $5/$10 game. The River: The fifth and final community card, known as the "the river" is placed face-up on the table. 4th Betting Round: The final betting round. Follow rules in round 3 above. The Showdown: The first player to show their cards is the last one to have placed a bet or made a raise. 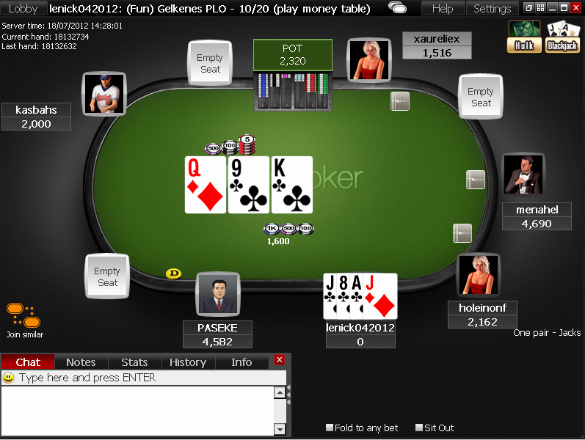 In the event that no bets were made during the hand, the player to the right of the dealer button shows their cards first and the winner is determined according to the best five-card hand. Start Over: The next hand of Omaha Poker begins with the dealer button moving one seat clockwise. Omaha Hi/Lo Poker follows the same rules as Omaha Poker, but in this variety of the game there is an additional way to win a share of the pot. Each player makes a separate 5-card high hand and another 5-card low hand. The pot is split between the best high and low hands (which may be the same player). The 5-card hand must be unpaired. Every card must be an 8 or lower. In Omaha Hi/Lo, the lowest possible hand is 5 4 3 2 A (of any suit, as flushes and straights are not deterrents for ranking the lowest hand). This combination of cards is also called the Wheel. In Omaha Hi/Lo Poker, the Ace can be used for both the high and low winning hands. A player may use different pocket cards to make his high hand and his low hand. If there is a low hand winner, the pot is split 50/50 between the high and low winner. In case of multiple low hands, the low winner is determined by comparing the highest of the low cards, then the second highest, etc. If the two or more low hands are equal, the low pot is split between them. If there is no qualified low hand in Omaha Hi/Lo, the high hand wins the entire pot. The game round of Omaha Hi/Lo follows the same steps and betting stages as Omaha Hi. Not sure about your game? Read Optimal Strategies for Omaha Hi Lo Poker. Tired of playing Texas Hold'em? Fancy a change of pace at the tables? If you're looking to freshen up your game or shuffle around your strategy, then you've come to the right place! Play Omaha Poker online at Titan Poker, and join the growing number of Omaha addicts who are currently enjoying the second most prestigious game in poker. What started as an alternative to Texas Hold'em Poker has grown into two exciting variants which are fast becoming rivals to the popular game. Whether your taste is Omaha High or Omaha Hi/Lo, Titan Poker offers an exciting range of Omaha Poker games and promotions for players of all levels to challenge both experienced 'Omaholics' and new beginners alike. If you're new to the scene, you'll find that Omaha Poker offers another thrilling game of mathematics and strategy which follows the rules of Texas Hold'em Poker, but is played with four hole cards instead of two. In both versions, players need to contribute to the big blind and small blind and form their best hand from two out of their four pocket cards and three additional community cards. The player with the highest hand wins in Omaha High. In Omaha Hi/Lo, there are two winners. The player with the best hand is the Omaha High winner, and player with the lowest hand below a 9 is the Omaha Low winner. What's more, Omaha Poker is easy to learn! Start studying Omaha Poker now and join the second biggest craze sweeping the poker world today! From the stories of our best Omaha Poker players, July 2011. Most poker players don’t know much about Omaha Poker, except for the fact that you are dealt four pocket cards instead of two. “nonamenochat” from Greece, however, is a master of the game and he proved it last night when he won the Monday Night Omaha tournament. “nonamenochat” defeated 44 other starters to capture the first prize of $2,000. It only took him three hands of heads-up play to knock out “FlameBoy87”, who had to settle for the second place prize of $1,250. Here’s a look at the final hand, played when the Greek player enjoyed a 4-1 advantage in chips. Pre-flop, “nonamenochat” called the big blind and the flop was dealt. It came T♠, 9♣, and A♣. This gave the Greek player a set of nines, but his opponent had both a straight and a flush draw. “FlameBoy87” led out with a small bet, the Greek player raised. This was re-raised and the Greek shoved to get all his opponent’s chips in the pot. The turn produced the A♠, which was enough to give “nonamenochat” his full house and the tournament victory. From the stories of our best Omaha Poker players, September 2012. Brazilian player “juaoMathias” is a skilled Omaha Poker player, and he proved this when he won the Monday Night Omaha tournament last night, capturing the first prize of $1,850. “juaoMathias” is a regular participant in this tournament, having previously taken first place on June 4th. Last night, 46 players paid the $100 + $9 buy-in to join the Monday Night Omaha tournament, staged every Monday night at 21:00 GMT+1 as a 6-player table freezeout tournament. The event lasted just under five hours and “juaoMathias” won the final hand when he used the A♠ K♠ of his pocket cards to complete a flush. Second place went to "xalexbrucex" who had to settle for a prize of $1,100.